A descriptive essay is an essay that gives a vivid description of a person, place, an object, or even an experience. The goal of such paper is to enable the reader to create a mental picture of the subject. Choosing a topic is often not where the problem lies as it is even provided in some cases. The main task before the writer is to show and tell the audience whatever information he wishes to convey. For instance, instead of saying “the room was silent” the writer could express it as: “The room was such that one could clearly hear the sound of a pin drop.” That is just a simple illustration of how to “show” and not “tell” when writing a descriptive essay. We now turn to examine the basic steps in writing one. 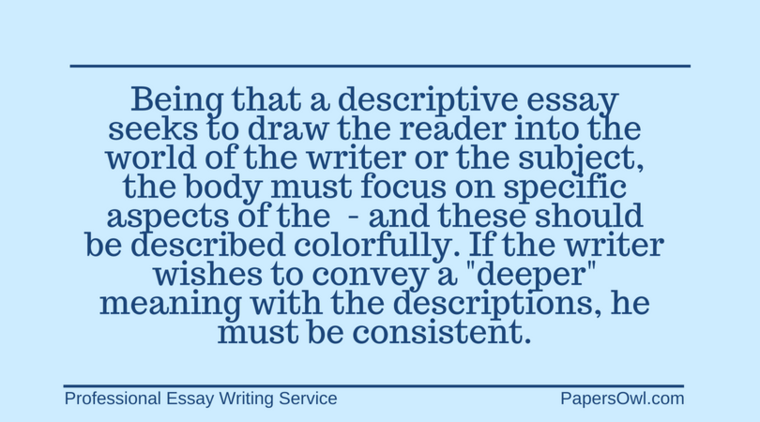 Descriptive essays are aimed to create an image within the reader’s mind. This type of work requires a certain structure and proper usage of ideas. 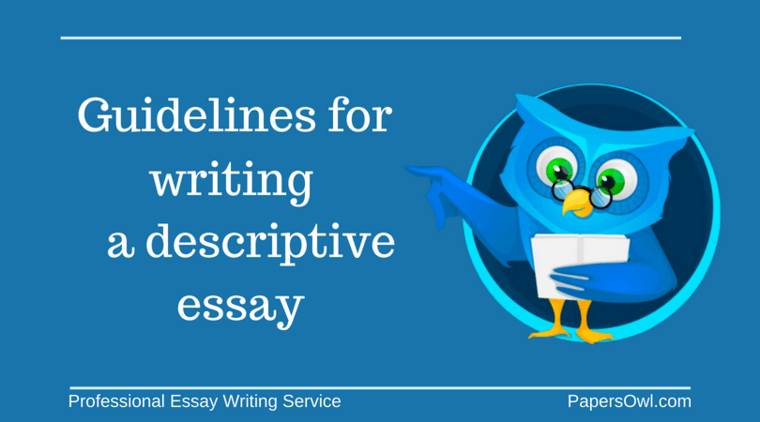 A step by step plan and following the following writing tips will help to fully develop the topic and write me an essay of the best possible quality. Grab the reader's attention. Yes, the lead sentence in the essay should be creatively used to capture the reader`s interest. This sentence should be intriguing; it should practically leave the reader hungry; it should stir up the imagination of the reader. Consider this introduction one might use for our sample essay, “Grandma`s wrinkled face”: We all know that nothing lasts forever; but looking at grandma, I would have wished this weren't the case. This sentence should be enough to get the reader thinking—and this would mean a job well done for the writer. The body is where the writer conveys much of the information on the subject. In a 5-paragraph essay, this should be the second, third, and fourth paragraphs. Each paragraph is begun with a topic sentence that instantly conveys the main idea of the paragraph. This topic sentence is followed by a thesis sentence. This thesis sentence develops an argument that the paragraph would be centered on. The remaining sentences in the paragraph should be used to do justice to the argument. Most importantly, the final sentence of each paragraph should transition smoothly and beautifully to the next one. For instance, the “hidden” motive for our sample “Grandma`s wrinkled face” could be to reflect on the how sad grandma is; and not necessarily how old she is. Sentences like this could help convey this “hidden” message: “It seems that grandma has been aging faster and faster ever since she lost her husband, her only source of happiness”. A statement such as this should be able to draw the reader’s attention to the emotional state of grandma instead of just dwelling on the “wrinkles”. In conclusion, a writer must recognize that the last sentence of any essay is likely what will stay with the reader; and therefore, the writer must craft this sentence as creatively as possible. The best thing that can happen to a writer is for his work to remain alive in the mind of a reader and writing a beautiful conclusion is one good way to ensure this.